In this section, you learn how to use the Pinned site API to create dynamic and personalized Jump Lists that are relevant to the user. 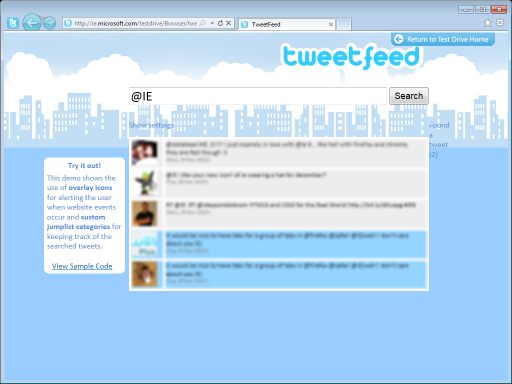 This scenario introduces the TweetFeed sample application. For the updated Windows 8 version of TweetFeed, see Fresh Tweets 2.0 - demo for Windows 8. By using the TweetFeed sample application, you can search Twitter messages for a #hashtag, @user, or other phrases. If messages are returned from the server, one of them is displayed randomly. The TweetFeed UI displays up to five messages at a time. Older messages are replaced as new ones appear. In the Adding Tasks to a Jump List scenario, you learned how to create a static list of Tasks by using metadata. This scenario shows you how to create a custom Jump List category for your Pinned site. In the Creating a Custom Jump List Category task, you learned how to create and show a custom Jump List category. In this task, you add items to the Jump List dynamically. This topic discusses the idea of using dynamic Jump Lists for a local events site by using geolocation and the Bing Maps API. Other ideas for using dynamic Jump Lists are also discussed.